A member of the surgeonfish family, the sailfin tang gets its name from the big fins it can extend that look like…sails. Very original! 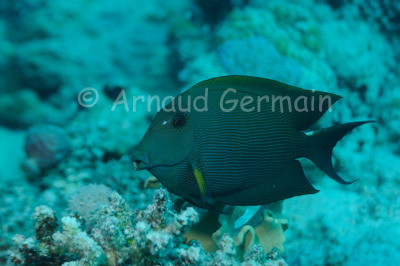 All surgeonfish have a razor sharp spine at the base of the tail called a scalpel, hence the name. The sailfish tang is a very common fish on the reef. Nikon D700, Nikon 28-105 mm macro at 105mm, F5.6, 1/60th, ISO 200, Ikelite Housing and Ikelite DS160 strobe set on TTL. Marsa Shagra Bay, about 12 metres down, Marsa Alam, Egypt.